Thinking where to go for your next family vacation? How about a spectacular island of Zakynthos in Greece, known for its beautiful beaches, among them world’s famous Navagio Beach? Consider Armonia Studios to be your base to visit area’s top attractions. 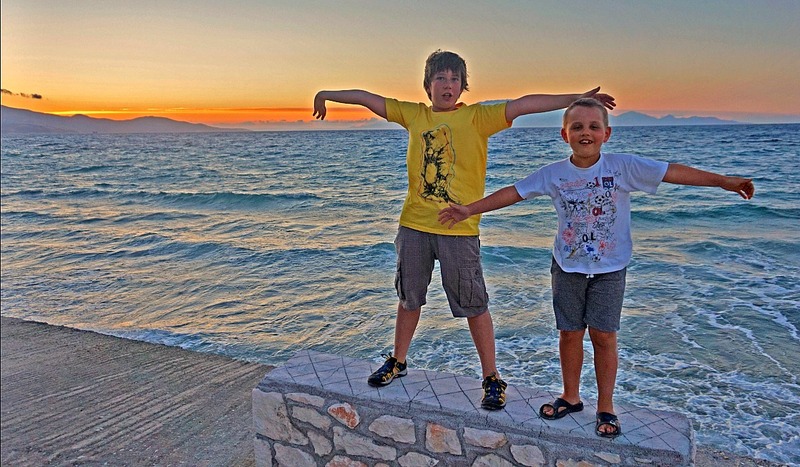 With a lovely sandy beach safe for kids, great views, outstanding service, and a restaurant with delicious food and its own playground, this hotel could be a destination on its own. 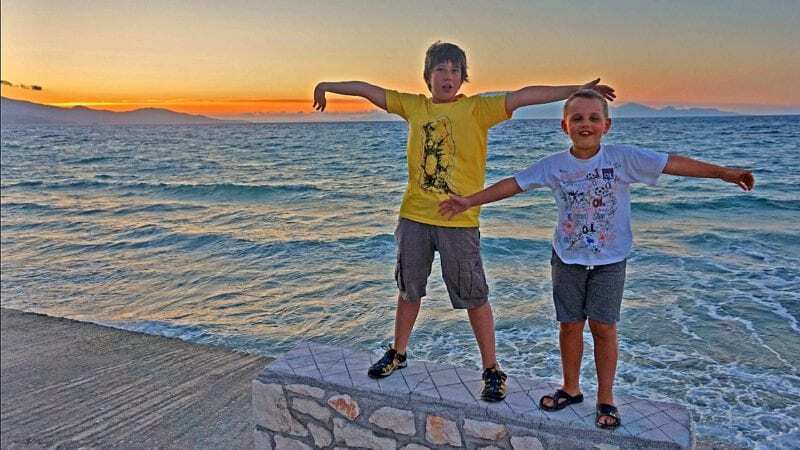 When I heard that my sister and her friend, both living in Poland, decided to take their young grandsons for a week long vacation to Zakynthos, Greece, out of curiosity I looked it up on the internet. Images of Navagio Beach made me think of coming with them. I quickly checked my base of miles/points/bonuses and I realized that I would be able to make it a free trip. 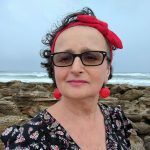 Both ladies did not mind another adult joining them so the decision was made – five of us were going to spend one week together in Greece. 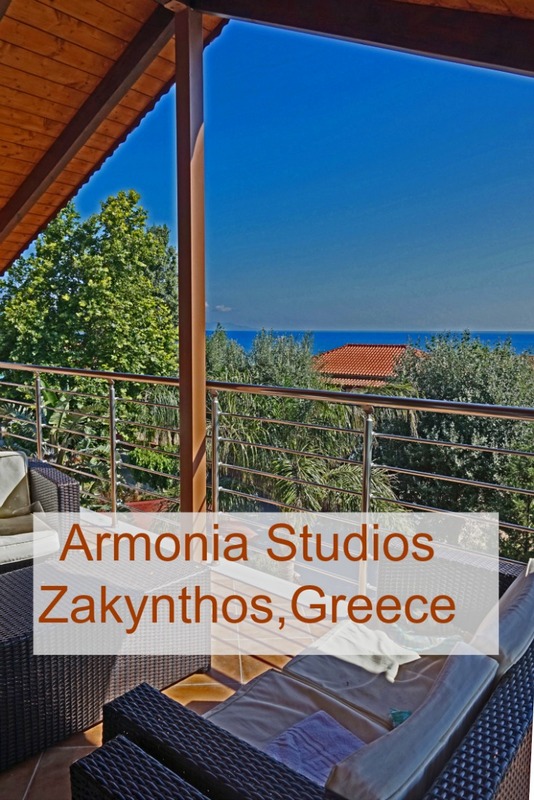 After a long search for lodging, we agreed that Armonia Studios offered the best combination of location, views, suitability for children, and price. It turned out it we made a perfect choice. 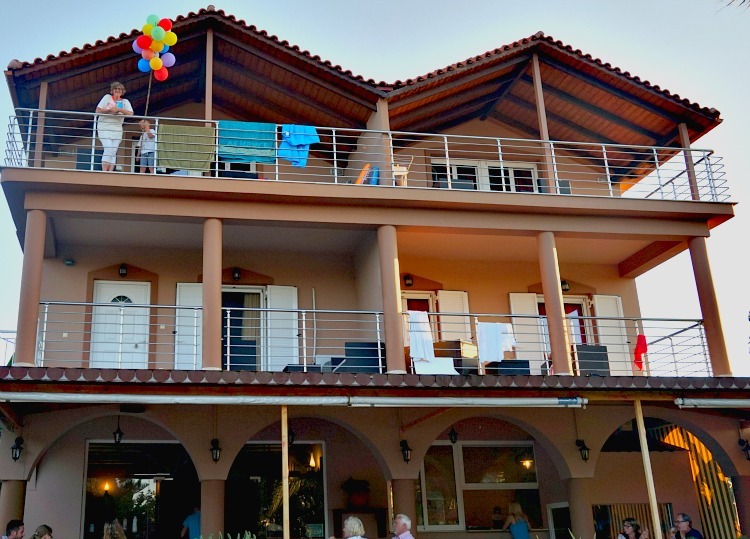 We split our stay in Zakynthos into different locations. We used Armonia Studios as a base to explore the northern part of the island, including Navagio Beach. We enjoyed its peaceful and authentic setting. 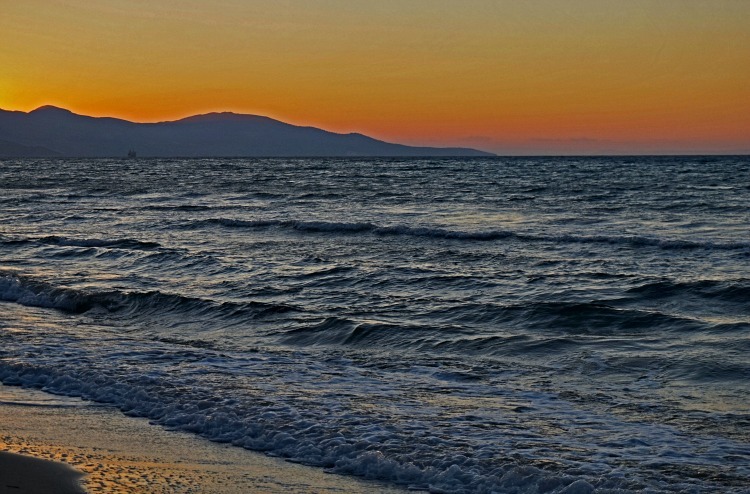 Many other beautiful beaches and small villages can easily be reached from the hotel. There is a small sandy beach right by the hotel. It is shallow and safe for children. It feels like a private beach, never crowded. Make sure to come at night for a spectacular sunset. Studios offer great scenic views of the surrounding area. 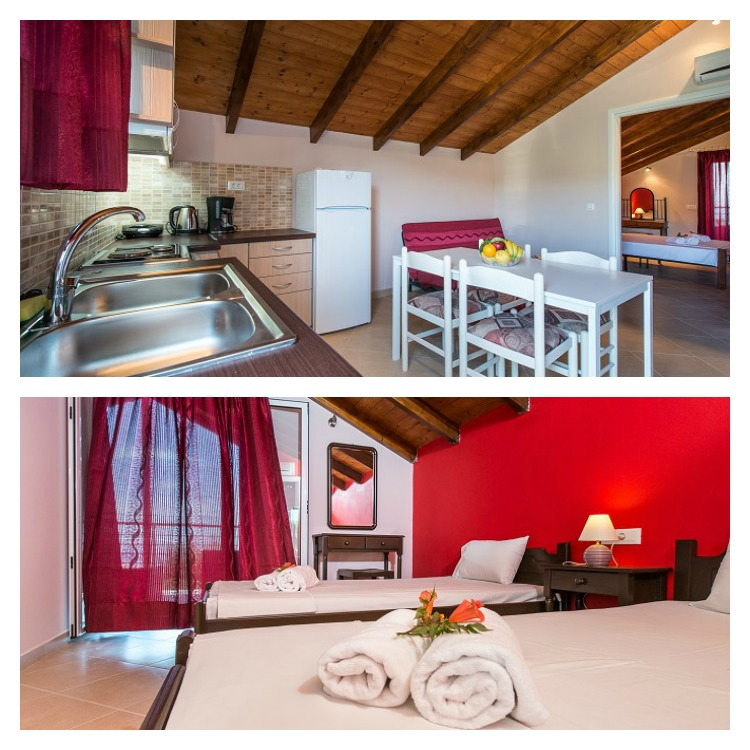 We had a two bedroom apartment with a small kitchenette/living area, one bathroom, and a huge terrace with a view. We paid $70 per night at the end of June. Rates are higher in July and August but still very affordable. Our apartment had everything we needed for a comfortable stay: air-conditioning, free Wi-Fi, good size refrigerator, stove and a free parking. Karras Grill, owned by Armonia Studios, serves delicious food made with fresh local produce. The restaurant has a garden-like atmosphere with outside sitting. There are tables available right by the playground. It is perfect area to take kids for a walk. In June, there were flowers everywhere. Local residents make sure that their gardens look colorful and inviting. Plantations of olive trees add to the Mediterranean atmosphere. A short walk away there is another great restaurant right at the water age. Beautiful location and lots of fresh fish. Our apartment was very clean when we arrived and kept clean during our stay. It was nice to come back to freshly washed floors and made beds after a long day of sightseeing. 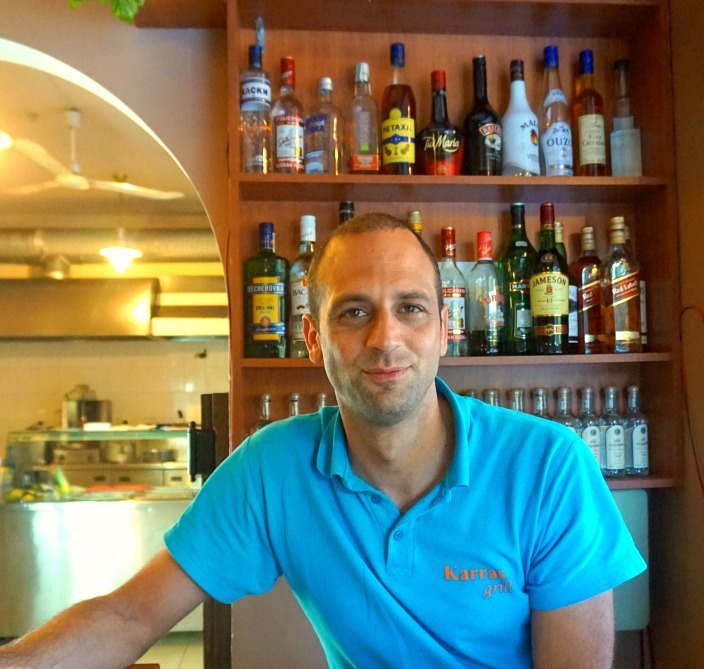 Dionisis, the owner, runs his business with pride and he will go out of his way to serve his guests. If needed, he will be your travel agent,waiter, receptionist,or delivery boy. Working around the clock but always smiling. I like his sense of humor, too. You can tell that his staff follows his example – always available for the guests. 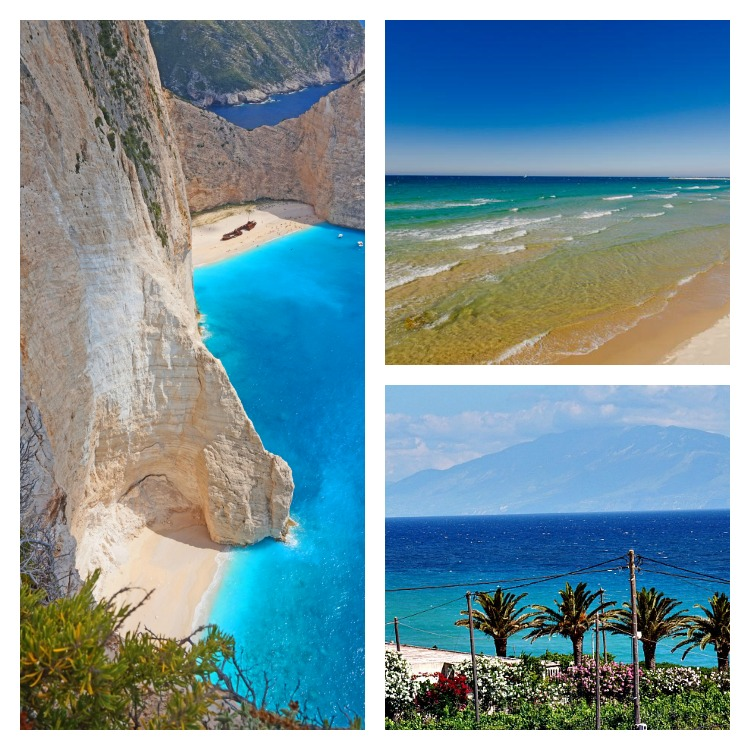 Learn more about Zakynthos and how to visit. Only those who come solely for the beach can enjoy their stay at Armonia Studios without having a car. They can use taxis to move around but to truly experience the island you need a car. This is just the nature of Zakynthos, regardless of where you stay. Again it has to do with Zakynthos in general. Roads are narrow and windy, signs are rare and often in Greek. My phone broke as soon as we arrive in Greece so I cannot tell how the navigation system would work. I had to use a map. Instead of 15 minutes, it took me an hour to find the place. I asked local people about directions, but majority of them were more familiar with Karras Grill than the hotel. I do not remember any big sign announcing Armonia Studios. I parked in front of the restaurant not sure where to go next and this is when Dionisis came to the rescue. In my opinion, a large visible sign is needed. I do not watch TV while on vacation so I was perfectly fine with it but some people can see it as a negative. That can be said about Europe in general. Beds in Armonia studios in my opinion meet European standards but are not as comfortable as in American hotels.